1 (C) 2012 INOV – INESC INOVAÇÃO InfoDay on Theme 3: ICT for Health 17-Feb 2012 INOV is a Registered Trademark of Inesc Inovação - Instituto de Novas Tecnologias. 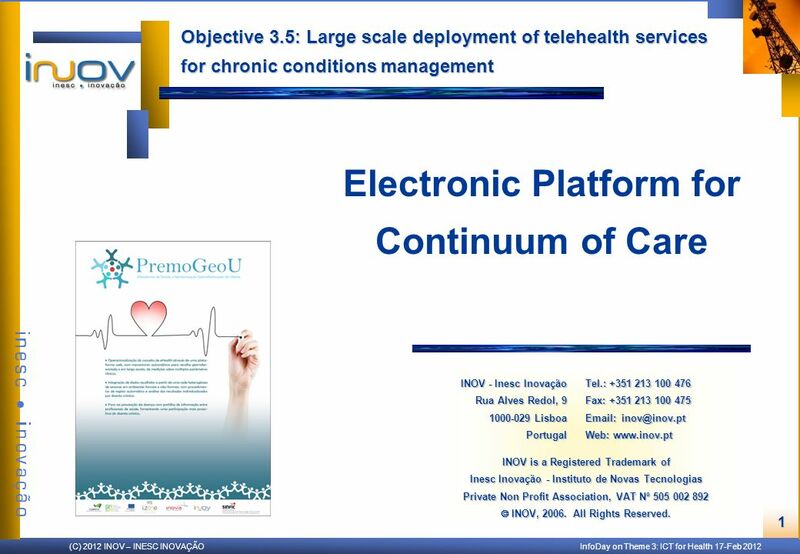 Download ppt "1 (C) 2012 INOV – INESC INOVAÇÃO InfoDay on Theme 3: ICT for Health 17-Feb 2012 INOV is a Registered Trademark of Inesc Inovação - Instituto de Novas Tecnologias." What Is The Problem Anyway? Prof George Crooks OBE. Presented by Susan Beresford BSCPharm. Objectives: Role of Pharmacists Increase awareness of resources (MRP) Impact of Medications Community Resources. Hospital Compare: A consumer quality tool Presented by: Michael McMullan Deputy Director, Center for Beneficiary Choices Centers for Medicare and Medicaid. CumprirQuioto.pt Portugals Kyoto Monitoring & compliance web-based system Eduardo Santos Manager, International Climate Policy Programme November 2010. Experiences of the EIII master classes related to the use of SF Olivér Komma 3 February 2011 Brussels. 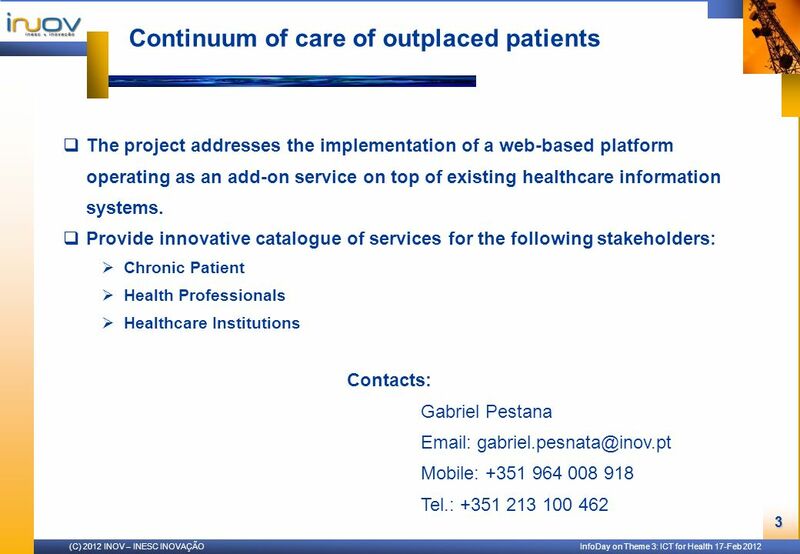 Slide title In CAPITALS 50 pt Slide subtitle 32 pt Integrated Healthcare Information System Darko Gvozdanović, M.Sc.E.E. Department manager e-health. Application for Foundation Trust Status.  What is a Foundation Trust?  Why should we become one?  What the Regulator (Monitor) looks for  How will. 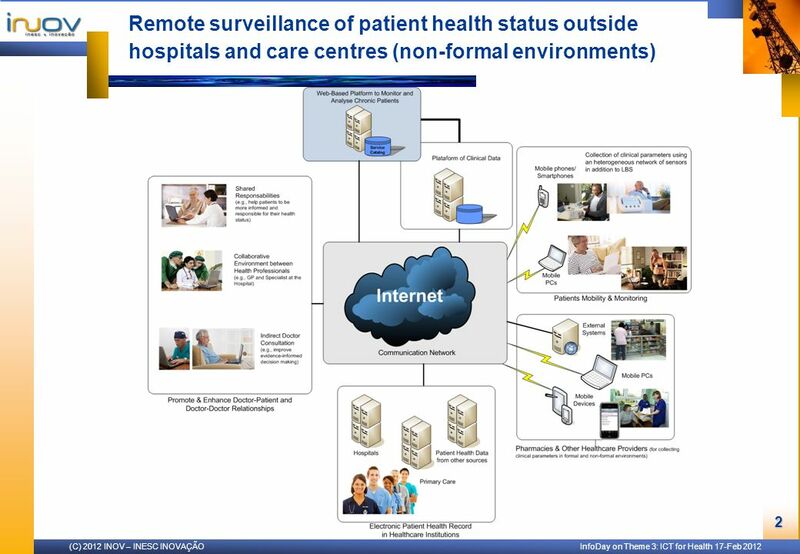 Access to Care: Primary Care Challenges and Recommendations July 17, 2014. Policy Framework Project Presented by Lisa Harris The International Alliance of Patients’ Organizations. Programa Prof2000 Online teacher’s training. Carlos Gouveia Programa Prof2000 Prof2000 Prof2000 Formação de Professores a distância  ICT in Education. Scotland Telecare and Digital Health Prof George Crooks OBE. Public-Private Partnerships in the Czech Republic Setting up a proper risk management system at the project level Twinning Project CZ/2005/IB/FI/04 Training. Virtual Collaborative Social Living Community for Elderly Kick Off Event Partner Instituto Pedro Nunes Paulo Freitas – António.